(San Diego, California, USA): Most business people will agree that it's good to have a base of customers and to do everything possible to to keep that base of customers. Why is this? Because gaining new customers is typically a much more difficult task. Remember, you'll never retain all your customers because companies will decide to use a new vendor and companies will eventually go out of business. The answer is advertising. In the helicopter industry, there are helicopter manufactures selling helicopters, helicopter operators, parts companies (selling new and used) and service companies. In my opinion, there are several things which quickly come to mind about the helicopter industry. There is not a worldwide printed yellow pages that serves the helicopter industry. It would be nice but it would be extremely costly to mail out such a yellow page book to every helicopter related company in the world. People and companies who need to purchase a new helicopter (civilian and military) have the option to buy direct from a helicopter manufacture or a third party and or lease a helicopter. Those who want to see helicopters up close and talk to the major helicopter manufacturers, in a shortest period of time possible, they can attend a helicopter trade show. Companies (such as contractors, pipeline companies, utility companies, construction companies, firefighting/agricultural government entities) searching for helicopter operators tend not to have subscriptions to helicopter magazines or attend helicopter trade shows. People needing helicopter parts and services can find companies advertising in helicopter magazines and at helicopter trade shows. However, when a buyer is in their office and needs to find a new parts supplier, they probably go online to find a vendor. What Is Creative Advertising? Creative Advertising is the seller searching for buyer. Anything that is not Directory Advertising, is Creative Advertising. It's the shot gun approach. 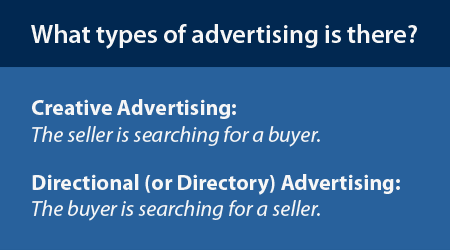 What is Directory Advertising? Directory Advertising (also known as Directional Advertising) is any printed directory book or website which lists companies by category (or name) and are alphabetized. People who use directories are buyers in the buying process, searching for sellers. Some examples of printed Directory Advertising are: The yellow pages, a small town independent yellow pages, a small tourist directory in a vacation area, and/or a company directory with employee and department names. Buyers use directory because they are in the buying process, and typically want to look at the advertising. Why? Because they are searching for the right product or service. They are looking for a seller. Banner advertising also alerts the buyer that the seller wants to earn their business. A buyer might be just down the street or in the next city but would have never found the right seller if it hadn't been for a directory! 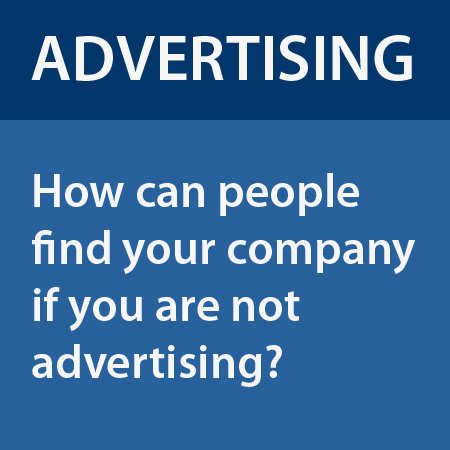 The best approach to advertising for any company is to use both Creative Advertising and Directory Advertising. While Creative Advertising is usually expensive, a business can typically afford to send out at least some mailers to companies they'd like to do business with, participate in a trade show, have a website and print business cards. The unique feature of advertising with Helicopter Links is that is is Directory Advertising, rounds out your marketing tool kit and it's affordability. Our clients also have the option to have several sales-only posts each month on Helicopter Links Facebook and Twitter pages. We will also post relevant articles about your company and press releases for your company, if you choose to use this free service. I hope this article helps you see the advantages on advertising with Helicopter Links website. Our goal with Helicopter Links, is to discuss with business owners in the helicopter industry about the most important parts of the business where they want to advertise, explain our advertising options and our prices. Business owners can then make an informed decision about adverting with Helicopter Links. Please feel free to give us a call +1 (858) 413-7074 or email us at staff@helicopterlinks.com and let's discuss how Helicopter Links can help you advertise to buyers in the helicopter industry who are in the buying process.